WWF is one of the world's largest conservation organizations, with a presence in over 100 countries across the world and over 5 million supporter members. WWF works to protect the world's species and natural places, pushing for a more sustainable world, by working with local communities, governments, businesses, and other NGOs. 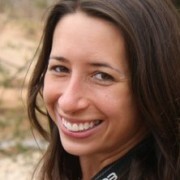 Liz is responsible for leading and coordinating WWF's global palm oil strategy and activities to achieve sector change. Liz has 10 years’ experience working in the environmental sector. Prior to joining WWF, she managed the Business and Biodiversity Programme for the Zoological Society of London to include its palm oil strategy and representation within the RSPO, and was an environmental consultant for Scott Wilson (now AECOM). Liz has environmental degrees from Cambridge University and Imperial College London. She served as Biodiversity and Ecology section co-chair of the International Association for Impact Assessment (IAIA), on the Executive Committee of the Business and Biodiversity Offsets Programme (BBOP), and as a Board Member for the Wildlife Friendly Enterprise Network.